Are you an avid baker? Do you enjoy the “ahh’s” you get when you present a new cake to your friends and family? 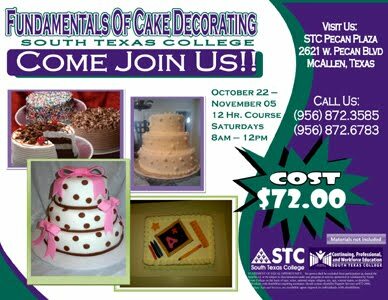 If so, now is the time to take your skills to the next level with the Fundamentals of Cake Decorating Class at South Texas College. 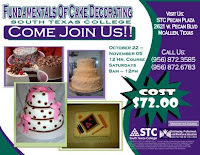 Offered through the college’s Continuing, Professional and Workforce Education Program, the course runs every Saturday from Oct. 22 through Nov. 5 from 8 a.m. to 12 p.m. at the college’s Pecan Plaza located at 2621 W. Pecan Blvd. in McAllen. The cost is $72 per participant. Participants will be asked to provide their own decorating materials and cakes for decoration at each class session. The class is open to participants ages 14 years and older. Minors must be accompanied by a parent or provide a parental consent form. It is open to the first 15 registrants. For more information or to register call 956-872-3585 or 956-872-6783.